Some Days I want to pull my hair out, throw myself face first on the floor and kick and scream, lock myself in the bathroom, go back to bed and cover my face with a pillow and pretend I cannot hear my family demanding that Mom come to the rescue. I think we all feel that way sometimes. Being a Mom is a lot of work. Sometimes it is hard, sometimes it is discouraging. Somedays it is frustrating. Today was not one of those days. Today was maybe the best day I have had as a Mom in a long time. My son woke me up in the best way possible. He gave me a few pats, I heard him giggle. Then he gave me a kiss on my forehead. I opened my eyes and smiled at him, he was smiling at me, then he said "Happy!" Yes. To wake up to a sweet and happy boy makes a good way to start the day. Our morning was nice. Roo was hungry and ate his breakfast without a fuss, then he was ready to play. He quietly laid down on the floor and got involved in a session of matchbox cars. I had a doctors appointment this morning (please note I am writing this post for publication several weeks in advance in preparation of my downtime after childbirth), and my husband stayed home to help me out with Roo. He was glad to see Daddy was home. We took the time to bake pumpkin cookies per Adam's request as today was also his birthday. I had a good visit with the doctor today. We have a week to go until Harper is here at this point and I am ready! To show my appreciation for my doc and his fantastic staff I went armed with tokens of affection for the exceptional care they have given me. It made me feel good to show these hard working people that their efforts don't go unnoticed by me. I am truly grateful to have been under their care. When I returned I got to hear all about a trip to the park with Daddy and we grabbed lunch. Roo was cute, happy and sweet. We ran some errands together. This included a trip to the pet store where Roo and I checked out the cats up for adoption. He is really into cats right now. He was cute to watch. For his cuteness we went next door for a new utility ball, perfect for kicking around outside. We were going to go to a corn maze, but an accident blocking the road kept us from continuing on. We spotted a rummage sale at a church and decided to hit it up instead. My son was lucky to find a big wheel there in good condition and for the bargain price of $5. How could I say no? We took Daddy out for dinner. While we were in the booth my son showered me with hugs, kisses and cuddles. We giggled together, we held onto each other for long moments, moments I wish I could freeze and make last forever. Roo was a great dining companion today and ate his dinner without a fight. When we got home and he had his bath and stories I asked him if I could lie down with him for a while, he patted the bed and invited me to cuddle up next to him. It took him a long time to fall asleep as he didn't want to let me go. I felt the same way and savored the moments of him touching my hair and face. Everytime he would start to nod off he would wake himself up and give me one more kiss. My hormones were in overdrive and I couldn't help but let the tears fall. I love that little boy so much. There are days when he is a gobblin, when he causes trouble, disobeys and destroys our house. There are days that I am exhausted and I don't take the time to just enjoy him... but the truth is I wouldn't change him for anything. I love his rotten, mischievous behaviors. I love that he is healthy and able to misbehave. 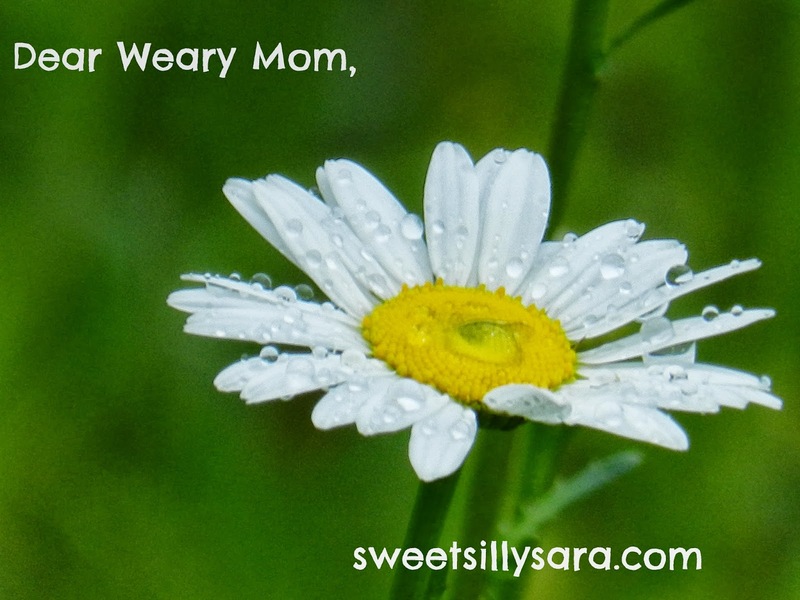 Dear Weary Mom, there are times when our kids make us crazy. There are times that it all seems like a lot of work, that it seems to be fruitless... but those days make us better parents. When we stop and realize that parenting is not easy, but it is worthwhile. That even the worst days are to be cherished and savored because that day is only lived once. We don't get it back. Hold onto it. Appreciate that your kids can be rotten. That they can get under your skin and make you feel something. I am not the best parent ever. But I try. I have been trying to appreciate my son for who he is, the good, the bad, the nutty. I wish I would have realized sooner that he is only small once. Each day he is older, he is a little different with each day that passes. Someday he will be too big to wake me up with giggles and kisses. Someday he won't want to kiss his Mom in a restaurant. Someday he won't hold my hand and want to look at kitties, but today he does and for that I am so grateful to have had this time with him. so cute I love when my kids come up and give me a kiss and hug out of the blue. Kids are the best! This is just beautiful! Motherhood is the hardest job there is, I don't care what anyone says. It's the emotional part of it that makes it so hard. It can wear you down to nothing but a sobbing mess some days and others days are brighter than sunshine. All of the days pass very quickly, almost the blink of an eye. I'm so glad you had this day and I'm sure there will be more just like it! Thank you for writing such a beautiful post and for reminding all of us. Parenting is so hard sometimes, we wonder if it will ever get easier, and then there are days like the one you wrote about. Thanks for the reminder. Beautiful! Parenting is a lot of work you are right!